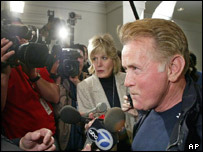 Actor Martin Sheen has featured in a US television advert urging Americans to join a 'virtual march' to oppose a war with Iraq. Sheen - who plays fictional US president Jed Bartlet in the television series The West Wing - wants people to deluge Washington with emails, faxes and phone calls on 26 February. He is one of a number of celebrities to join church leaders and other activists in urging the move, which was announced at a press conference in Los Angeles on Wednesday. Anti-war groups have had difficulty buying national air time in recent weeks. CNN and other networks say they are reluctant to air any anti-war spots. To get around the problem, groups are buying up time from local cable companies. Sheen's ad will appear on both CNN and the Fox News Channel in Los Angeles and Washington and will run throughout the next week. "This virtual march on Washington will allow every American opposed to the war to stand up and be counted, by calling, faxing and emailing the US Senate and the White House," Sheen says in the ad. Other celebrities flanking Sheen at Wednesday's press conference included Janeane Garofalo, best known for Reality Bites, and Mike Farrell, star of sitcom MASH. Sheen has been highly vocal in his opposition to the war in recent months. In December last year he was one of more than 100 celebrities to sign a letter urging President Bush not to go to war. Sheen also led an anti-war march on Los Angeles in January.